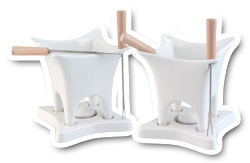 You don't have to be a 60's hipster to love fondue - this treat is back to stay! Authentic cheese fondue uses Swiss cheese melted in Swiss wine. Since cheese contains fat, and wine is basically water, there is an obvious problem; water and fat do not mix well. So what do you do to guarantee a velvety fondue? You must use a natural and well aged Swiss cheese that will melt smoothly. Also be sure to select a wine of the proper acidity (dry wine) that will blend successfully with the cheese. Meat fondue originated in France in the middle ages. During the grape harvest, pickers set up pots in the vineyards to cook their meals as it became convenient for them during the day. This ensured a leisurely lunch that could be enjoyed hot and fresh. 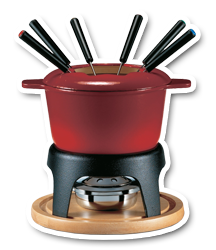 In later years meat fondue Beef Bourguignonne was created and became known as the original meat fondue recipe. Today this original recipe has evolved in many variations to include using chicken, seafood and much more. 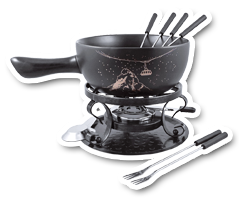 Cast iron fondue sets are best suited for meat fondues because they provide even heat distribution and are ideal for cooking at high and low temperatures. If the pot is enameled on the inside it can also be used for a small cheese fondue. To use as a cheese fondue, simply remove the splatter ring for easier access to stir and dip. Chocolate fondue was created by a Swiss Chef, living in New York, in the 1960's and is the perfect way to stir up a dinner party. It is practically effortless to prepare and your guests can participate and enjoy a delicious chocolate dessert at a relaxed and fun pace.